One of the biggest investments a person makes in their life is their vehicle purchase. For drivers old and new, owning a vehicle is a huge responsibility, one that should never be taken lightly. 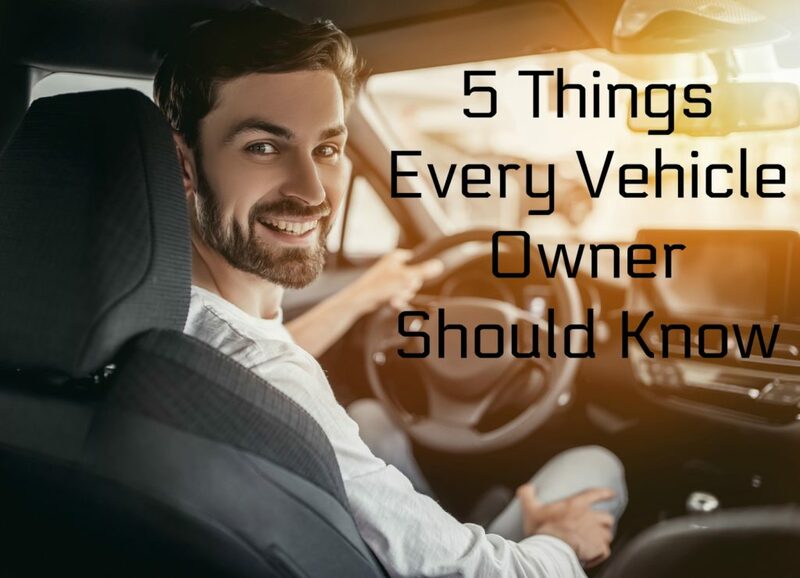 If you are lucky enough to own a vehicle, there are some important things that you should know to remain safe and to keep your investment running in its best condition. Fortunately, the knowledge is not hard to come by. Every vehicle owner should understand how to perform your basic automotive maintenance. This includes being able to check things like the antifreeze, brake fluid, oil, and windshield wiper fluid. You should also learn how to jump-start a vehicle and change a tire in case of emergency. Investing a little time to learn such things can save you time and money later. Vehicle manufacturers know that it is not realistic to expect every driver to know every little thing about their vehicle, so they supply you with a vehicle owner’s manual. This manual provides you with information specific to the needs of your exact vehicle make and model. Never lose your owner’s manual! This manual will let you know what maintenance tasks should be prioritized and provide guidelines on how often maintenance tasks should be performed. It will also tell you what each dashboard light indicates in your vehicle. To drive in Arizona, you need more than just a valid drivers license. You also need to have your vehicle registered and insured. Once you have done this, you need to keep your information in a safe place in your vehicle in the event you have been pulled over or there was an accident. Keep all the information together in one easy to reach spot, and don’t let it expire. Every vehicle should have an emergency kit in the trunk. A first aid kit, blanket, spare tire, flashlight and jumper cables are all very important, but along with these things, you should include gear that could be important in the climate in which you reside. In the Phoenix area, extra water, sunscreen, and even Chapstick may be some items you want to consider. Always remember, safety first! Read online reviews, and look around until you find a mechanic that will work with you and makes you feel comfortable. One that is honest and direct with you about the state of your vehicle and has the knowledge and technology necessary to take care of your vehicle. If you are near the Phoenix area, we know just the place for you to begin, here with the automotive repair professionals at Virginia Auto Service. At Virginia Auto Service, we like to help people with their vehicles and road safety in any way that we can. We are your go-to in Phoenix, AZ for reliable, high-quality auto repair services. Call (602) 266-0200 or schedule an appointment online. We look forward to seeing you.